Are You Ready to Make the Case for What You Believe As a Christian? 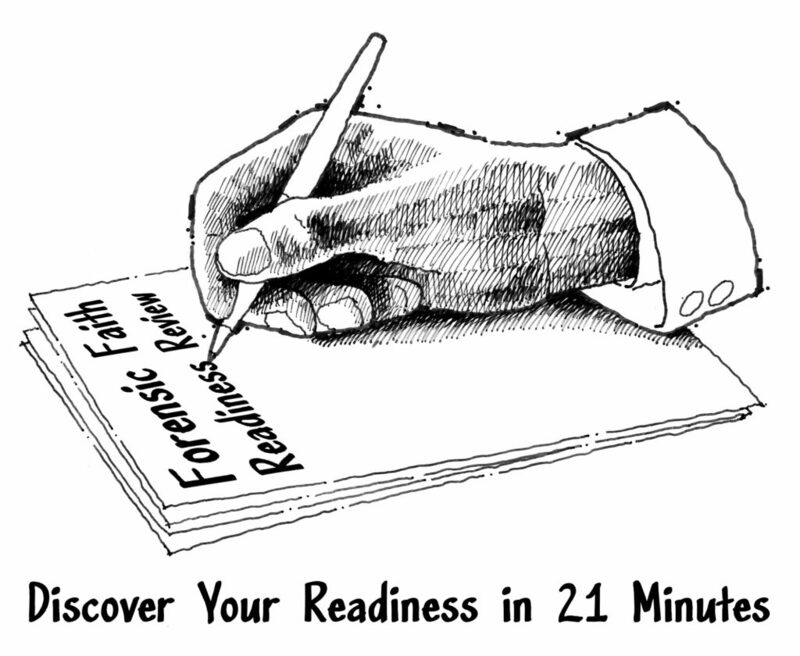 The Forensic Faith Readiness Review is a simple tool to help you determine if you’re “ready to make a defense to everyone who asks you to give an account for the hope that is in you” (1Peter3:15). This seven-question survey is designed to evaluate your strengths and weaknesses as a Christian Case Maker. Download it now, print it out and take the twenty-one minute test. 1. Was it difficult to think of a response for each question? 2. Did you struggle to articulate an answer without simply relying on your own subjective experience? 3. While there aren’t necessarily “right” or “wrong” answers for each question, some responses are definitely more persuasive than others. Do you think unbelievers would be satisfied with your answers, especially if they asked for objective evidence to support your claims? What evidence do you have to believe God exists? Why do you trust what the Bible says about Jesus? Why would God send people to hell just because they don’t believe in Jesus? If God is all-loving and all-powerful, why is there so much evil in the world? If God is the creator of everything, who created God? Why would a loving God command the total destruction of all of Israel’s enemies (including their children and livestock)? To learn more about how you can prepare yourself to defend what you believe as a Christian, please read Forensic Faith: A Homicide Detective Makes the Case for a More Reasonable, Evidential Christian Faith.